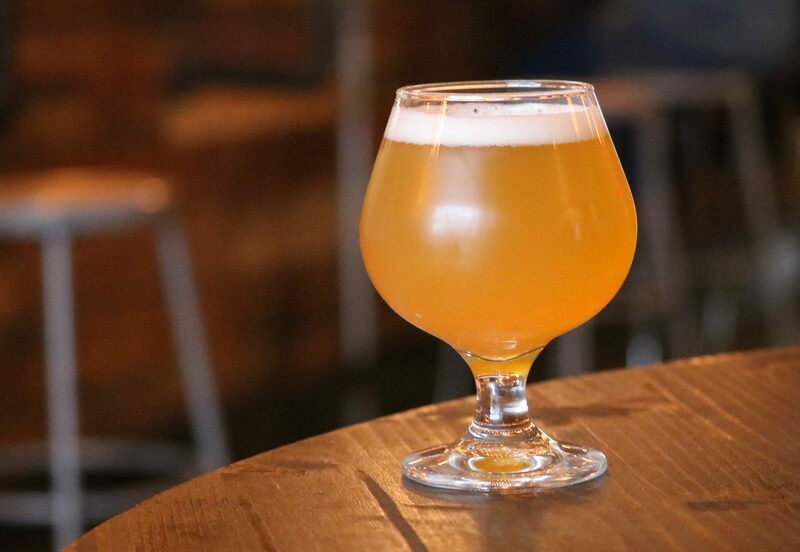 There are few holdovers from our old Staff Series: Courtney Rosenberg’s Foreshore Shandy is a summer favorite, Steve’s Biscuits & Honey will be back later this month, Jim’s Tripel Wreck we’ve made with cherries and is on tap now along with Courtney Gingrich’s Concrete Ship, and Brian’s Geek Out (2.0, 3.0, 4.0, etc.) will be back soon. Andrew started at CMBC three years ago as a delivery driver, and worked his way off the road and into the brewhouse. “I was kinda just lucky,” he says of his rise through the company. “Kinda in the right spot at the right time. 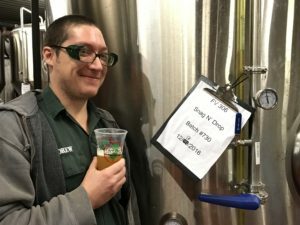 I had experience and wanted to become a brewer. The opportunity arose and I was the logical choice,” he jokes. He’d always had an interest in beer, with some homebrewing experience under his belt. 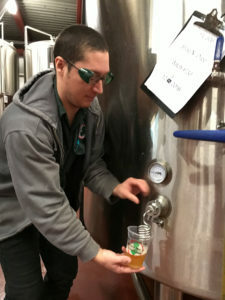 “Not as intense as [Head Brewer Brian Hink] — I don’t think anyone is.” But he got his feet wet with “easy stuff to brew”: Brown Ales, Lagers and the like. So, the two were going to do some “Frankenstein stuff” on the old 15-barrel system, but they soon wised up. They had the brilliant idea of using the mash tun as a dry hopper: an idea that could work in theory, but 300 pounds of whole-leaf centennial hops could also collapse the false bottom of the mash tun. (“It was likely going to happen.”) So… maybe… testing out that theory on someone else’s equipment isn’t the hottest idea. After some judicious thought, Hank put the kibosh on that plan. Regardless of the potential destruction of company property, Snag and Drop was born. 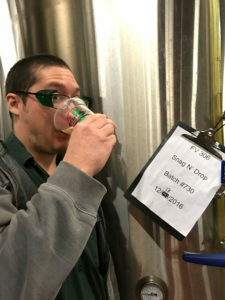 We use some bittering hops in the dry-hopping process, which we don’t do for any of our other brews. “I just like how Snag and Drop showcases a bunch of hops, and the balance is just insane on it,” he says. “You get super-hoppiness, a little bit of the maltiness, it’s not overpowering of an alcohol burn. We were sipping a sample of Snag and Drop during our conversation with Andrew, and he’s not exaggerating. It’s usually pretty chilly in our Interrogation Room (yes, that’s a thing here), and Snag and Drop chased the winter chill away. True, Andrew. And they all want to know about the beer, too. If you want to know about the beer, head down to the Tasting Room. Snag and Drop is on tap now. Triple IPAs are a fickle thing. The industry kind of keeps moving the goalpost on them, setting it just slightly farther out. Consumer’s tastes are constantly evolving, and CMBC is resolved to stay at the forefront. Thankfully, Snag & Drop falls into that category.